Spring ahead! As we wake up this Sunday morning, it’s wonderful to know that we are on the cusp of another splendid spring in Western New York. Make sure to remember that this is also the beginning of daylight savings time and our clocks need to be set one hour ahead. That is tough on our internal clocks for sure. We gain an hour of daylight today, but we loose an hour of sleep! Today’s Sunday Morning Television reveals a pair of Hooded Merganser ducks engaged in the annual spring ritual of courtship. This video was shot last year in April at Tifft Nature Preserve in Buffalo. This year these courtship activities are already underway. In fact, anecdotal evidence is that many of natures activities are underway, and this year things may be occuring a bit early. It has been a warm winter. We now have Woodcocks engaged in their annual spring dance, and surprisingly from Beaver Meadow Audubon Center in Java, we have word of Bluebird’s nesting and already having eggs! Are we witnessing the efffects of climate change? We reached out to many of the local leaders that live in the Alabama/Shelby area and asked how we could help. There is a public comment period that we can all contribute to, but it ends at 4pm on March 15. Two days from today. We compiled a Facebook “note” that you can view here, that describes some of the talking points that you can use if you care to make a comment. Written comments concerning the permit applications can be mailed to Administrative Law Judge D. Scott Bassinson, at DEC’s Office of Hearing and Mediation Services, 1st Floor, 625 Broadway, Albany, NY 12233-1550, or emailed to Judge Bassinson at scott.bassinson@dec.ny.gov. All comments must be recieved by March 15, 2016 at 4:00 p.m. 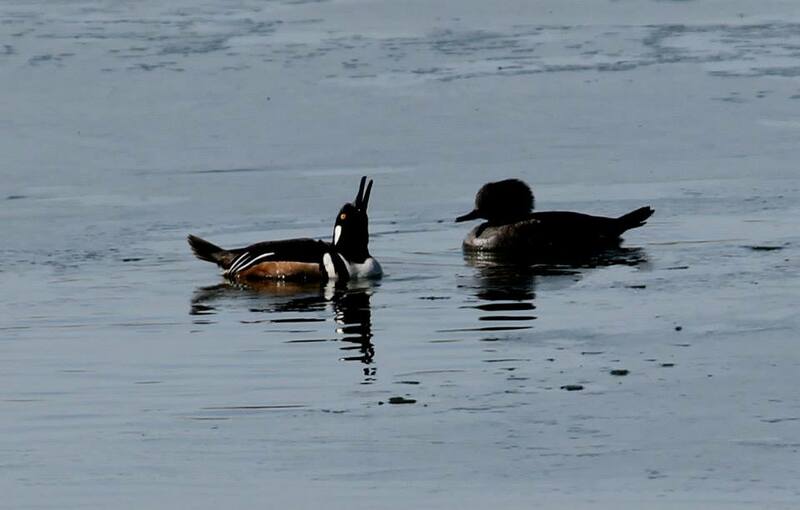 In honor of protecting the Iroquois National Wildlife Refuge from what may be one of the most egregious acts of the taking of our natural resources of our generation, we bring to you today, Hooded Merganser’s on Buffalo’s Waterfront, just another in a line of threatened natural resources that protect, educate, and enlighten us. Get outside, enjoy nature, the newly spring found singing of birds, and think about how you can help protect our natural world from inappropriate development. The quality of life of future generations depends on you!